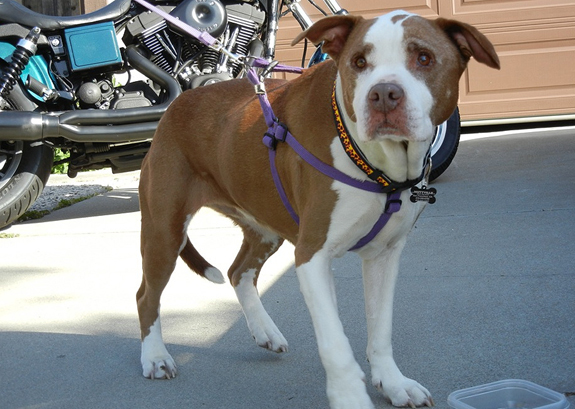 Stella, a beautiful, red and white, 9-year-old female pit bull, came into my life on June 3, 2011. 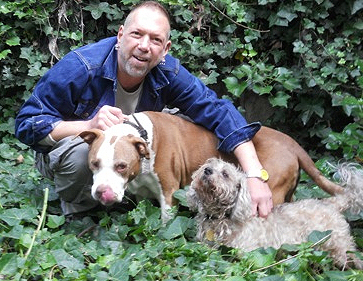 Josie, from San Jose, had been fostering Stella (who was then called Smoochy) and drove all the way out to my place in the Richmond district of San Francisco, just so that Samson, my 14-year-old terrier/poodle mix, and I could meet her. It was love at first sight for me. Samson, however, had mixed feelings about this 68–pound creature that was getting way too much attention from his own human. We kept Stella, purely on a trial basis (although I had already decided to keep her), to see if we could possibly become a happy family. 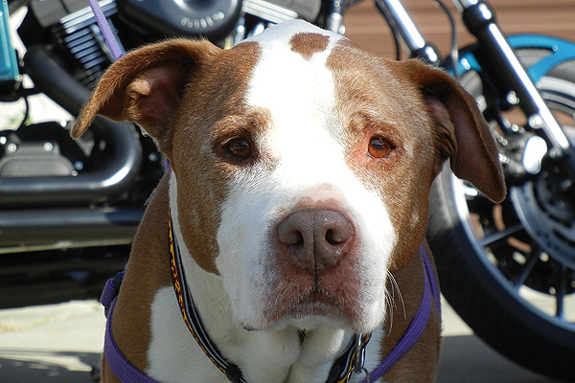 For Stella, this was yet another new environment – she had been at the Marin Shelter prior to Muttville Senior Dog Rescue taking her in and placing her in foster care. The first night the big girl stepped up onto the cedar chest at the foot of my queen-sized bed and just stared at me as if to ask permission to come up and join Samson and me. I was so impressed by this massive dog’s politeness. Someone had trained her. She sits when I ask her, stays, comes (most times) and gives enormous kisses upon request. As our adventure began to unfold, I found that most people, especially those at parks, were excited to welcome Stella’s warm greeting. Pit bulls, I had found, are not as frightening to most people as I had previously believed. Stella is a kind and gentle animal with child-like emotions that allow her to feel great happiness from the smallest of gestures. She is also as graceful, if not more so, than any other dog I’ve had in my life, even though her size and weight alone could total any three of them. Feeling confident about taking her along with me to the doctor’s or dentist’s offices was a concern for me at first, because I’ve always been welcomed to bring Samson along with me, in fact encouraged, whenever I have an appointment. Well, the first time I had an appointment with my primary physician, Ms. Stella, as well as Samson of course, came right into the waiting room, where she was greeted with great warmth by fellow patients, as well as the entire staff. I had the same concern with taking Stella to see my good friend who runs a store in the Haight. I like to visit him a few times a week and generally hang out to shoot the breeze for several hours at a time. But time flies when you’re visiting a good friend, and I was afraid that I might have to shorten my visits if Stella was not comfortable in the store’s environment or if the customers were not as comfortable as they are in most every case when they see Samson, who is one of the store’s mascots. But again, Stella pulled her own weight, warming up to customers and melting my friend’s heart from the very first day that we visited. During my most recent adventure, my good friends and I, as well as Stella and Samson, all went for a three-day vacation to a friend’s home in Calistoga. We started out on a Tuesday morning, all packed into my PT Cruiser, with Stella putting a heavy lean on one of my friends and stretched out across another in the back seat, all quite comfortable. After lunch we switched drivers, and I took over as official headrest for the girl. When we arrived at our destination, Stella would have nothing to do with the backyard, which adjoins a vineyard, has a huge deck, lush gardens, and outdoor kitchen and pool. I couldn’t understand why she wouldn’t enjoy the freedom and beauty of being in such a place, but she did frequent the yard to use as her bathroom (thank God). She’s been very good about waiting until she’s outside. Stella did, however, manage to have a good time, because she got plenty of hugs and treats, especially from my friend’s 11-year-old son. She appears to be an excellent pet for children. Even I cuddled up with Ms. Stella for a hug on the sofa in the afternoon and found myself waking over an hour later with her still in my arms. Upon our return home, while pulling into the garage, I noticed both dogs getting excited in the backseat. After opening the door to the lobby of our building in which we live, both Stella and Samson ran up the stairs like two children running to the tree on Christmas morning. Stella was home. It was then that I truly felt in my heart that Stella the pit bull is and always will remain a big part of my life. I LOVE her, thank you for sharing her story, she reminds me of my dog Honey, and I love Stella’s squishy face and neck, I just want to kiss and hug her! Beautiful! So glad to see that she has a happy home thanks to Tommy. I love her markings! @Darcy Thanks Darcy, she is a sweetie. 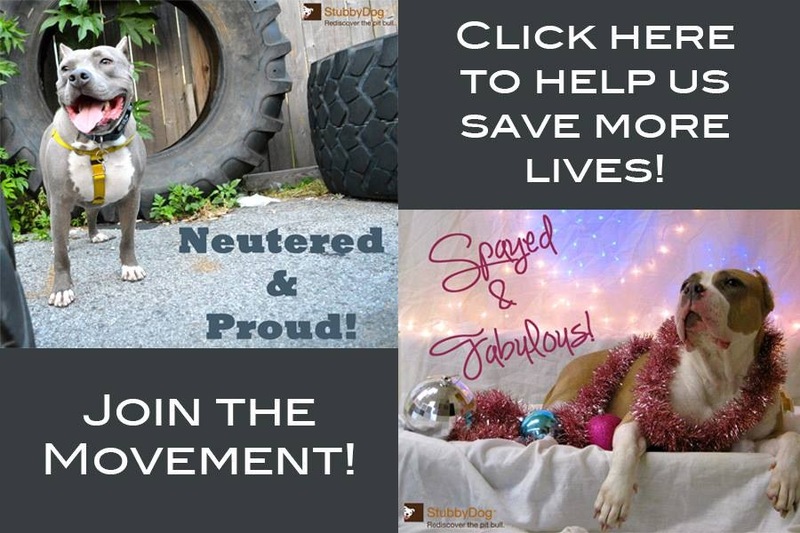 If the media had more stories like this, there would be less people afraid of pit bulls – wonderful – thank you for sharing! @LynneGobioff Thanks Lynne, that’s exactly what we are trying to do at StubbyDog.